The salty, slightly briny flavor our Capers pairs perfectly with smoked salmon and dill. This gourmet dish is simple to create for brunch or dinner. Add all crepe ingredients into a blender and blend until smooth. In a large non-stick sauté pan on medium-high heat, add just enough butter to coat the pan. Slowly pour in crepe batter while holding pan off the heat and swirling the crepe batter in a circular motion to get a thin layer of batter on the bottom of the sauté pan. Cook for about 1 ½ minutes or until loosened from the bottom of the pan and lightly browned. Flip the crepe and cook another minute until lightly browned. Remove from pan and place on plate and continue process until batter is gone. In a small mixing bowl, combine the ricotta, cream cheese, lemon juice and zest, and dill. Season with cracked pepper. To assemble the crepes, spread a small amount of the cheese and dill mixture over one half of the crepe. 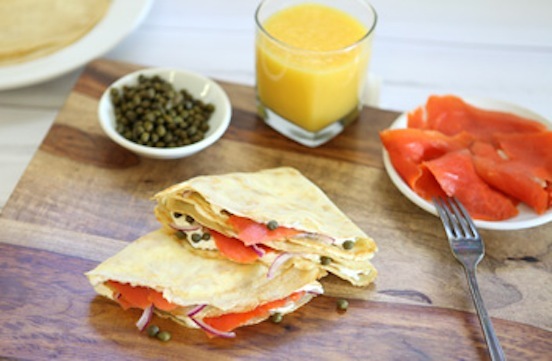 Add a thin layer of smoked salmon on top of half of the cheese, generously sprinkle with capers, add thinly sliced onion and fold crepe into quarters and serve.